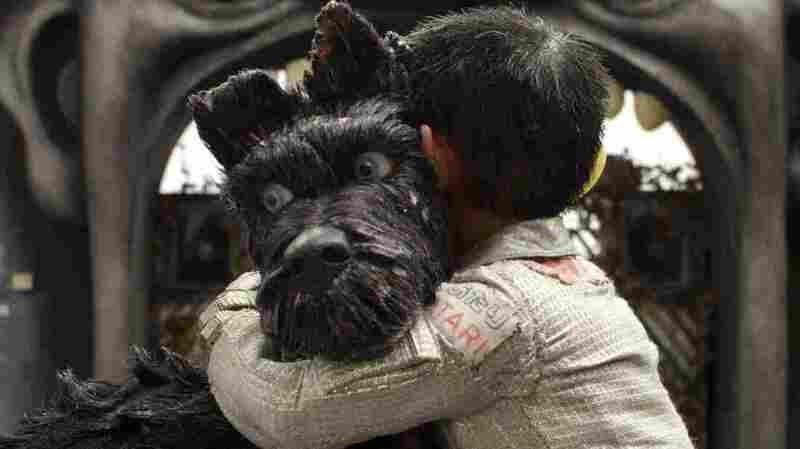 The Fast And The Furry Us: Wes Anderson's Masterful 'Isle Of Dogs' Anderson imbues this stop-motion-animated film about loyal dogs exiled to a lonely island with his signature formalism, but there's real emotion in those pups' wet, soulful eyes. Bryan Cranston voices the gruff-but-lovable mutt Chief in Wes Anderson's star-studded, stop-motion tale Isle of Dogs. Not even Anderson, who certainly seems like he might be a cat person, with his velvet-and-tweed blazers and his indoor scarves and his arched-eyebrow worldview. But no one will question his right-thinking canine-supremacy bone-a-fides after Isle of Dogs. (Go on, say the title out loud.) His dizzying new stop-motion epic is so visually rich, so narratively ambitious and so openhearted in its admiration for Japanese culture and the unshakable loyalty of doggos that it'll likely roll right over the familiar cries that Anderson is too fussy or whatnot like a Corgi rolling over for a belly rub. It's a gorgeous mutt of a movie, all right, mashing up Akira Kurosawa — not just his samurai epics (and their scores), but his urban crime pictures, too — and postapocalyptic survival flicks like Mad Max into a wholly original adventure that'll leave you wanting to pet every dog you meet, its bloody warnings about the hazards of petting strange dogs be damned. Set in Japan "20 years from now," Isle of Dogs posits a Snout Fever outbreak in fictional Megasaki City that compels authoritarian Mayor Kobayashi (Kunichi Nomura) — a descendant of the cat-loving Kobayashi dynasty, whose inhumanity to Man's Best Friend goes back to before "The Age of Obedience" — to order all dogs in the prefecture deported to Trash Island. (Nomura is also part of the writing team, along with Anderson and frequent collaborators Roman Coppola and Jason Schwartzman.) First to go: Spots (Liev Schreiber), elite guard-dog to the Mayor's 12-year-old nephew Atari (newcomer Koyu Rankin). The double-whammy of a reactor meltdown and a volcanic eruption have left Trash Island unfit for human habitation. There, sneezing, starving mongrels fight over rotten scraps amid abandoned theme parks and rusted-out power plants. Chief (Bryan Cranston), a stray who's used to scrounging for his supper, encounters a pack of fallen pets struggling to adapt to life in the wild. "I've seen cats with more balls than you dogs," he spits. Voicing the pampered pups are the Wes Anderson Players: Rex (Edward Norton); baseball team mascot Boss (Bill Murray), Puppy Chop Puppy Chow spokesdog King (Bob Balaban) and Duke (Jeff Goldblum), for whom gossip is the one comfort that exile to a radioactive garbage dump can't take away. The dogs' stop-motion fights, charmingly rendered in "dust clouds" that are in fact wads of cotton, draw stop-motion blood, which is perhaps why this profanity-free doggy cartoon carries a PG-13 rating. It's not for little kids, who may be entranced by the visuals — stop-motion has an analog character and dimensionality that even the best computer animation can't replicate — while finding the film's conspiracy plot baffling. Nine features and 22 years into his career, Anderson's pungent cocktail of childlike wonder and grown-up ennui no longer feels as jarring as it once did. His sensibility arrived fully formed with 1996's Bottle Rocket, and by 2004's The Life Aquatic with Steve Zissou — which used stop-motion to depict its exotic specimens of marine life — some critics were accusing him of being less an artist than a walking assemblage of tics. "In 12 years he'll be eleven-and-a-half," Cate Blanchett's character says at The Life Aquatic's climax, looking down at her pregnant belly. "That was my favorite age," Bill Murray's Steve replies. The line finds an echo in Anderson's new film, when Nutmeg, a former show dog voiced by Scarlett Johansson, tells Chief that he should stick his flea-bitten neck out for young Atari because "he's a 12-year-old boy. Dogs love those." It's true: Anderson is obsessed with the transition from late boyhood to young manhood, and that obsession has been a barrier-to-entry for some. His prior opus, 2014's The Grand Budapest Hotel, brought a lot of skeptics around, eventually scoring him an Oscar nomination for Best Director and another for Best Picture. His only other fully stop-motion feature, 2009's Fantastic Mr. Fox, dropped us into a world of wild animals under mortal threat from humans, even as George Clooney's Mr. Fox struggled to master the feral impulses that kept putting his family and his community at risk. Like every Anderson movie regardless of the age (or species) of its protagonist, it was a story about how painful it is to grow up. Atari, the preteen hero of Dogs, is already virtuous and honorable when the story begins. It's Chief and Spots, primarily, who're forced to grow. And these remarkable puppets, their bulbous eyes frequently spilling over with emotion, have no difficulty stoking our empathy. As is often the case with Anderson's work, the movie's formalism is itself a refined pleasure, especially with its approach to language. Courtney B. Vance's stentorian voice-over is in English, and the dogs speak English, but all the Japanese human characters speak Japanese and are performed by Japanese actors. (Rankin, who was all of eight years old when he recorded his dialogue, is half-Japanese, born in Canada to a Japanese mother.) All onscreen text, including the credits and the judiciously deployed subtitles, is shown in English and Japanese, and when Anderson translates the Japanese speech, he uses a number of ingenious methods, including an onscreen interpreter voiced by Frances McDormand. Equally inventive is the way that all video feeds seen in this stop-motion world display hand-drawn animation. It's too bad that Tracy — Greta Gerwig's American exchange student — gets to drive the conspiracy plot instead of one of her Japanese classmates, but at least she has a more active role than female characters tend to get, in Anderson films. But by the time Anderson's animators show us a meal of sushi being prepared in meticulous close-up, I was ready for any trick Anderson wanted to perform for me. Isle of Dogs takes Best in Show.